DUMP is, of course, the ongoing solo/side project of James McNew, better known to most as the bassist of that long-standing indie-rock band we all know and love, Yo La Tengo (in trying to describe his role in that group to someone recently, I asserted that he was “somehow both the George and the Ringo of that band.”) What you may not know, is that McNew is actually originally from Charlottesville, and spent time here as a WTJU DJ in the 80’s as well as working at the infamous Corner Parking Lot (he’s heavily featured in the successful documentary about said Parking Lot, which I’m sure many of you have seen.) I very much wish I had known this fact when I met James McNew in New York City back in 2004, when I spent the better part of an hour helping him attempt to carry what must have been the heaviest antique organ ever assembled up the stairs of Anthology Film Archives. Anyhow, like many of us I’m very excited that James McNew is playing Dump show here in town. I inisitually assumed it was part of some small East-Coast tour or something; but nope, he’s actually just playing this one show. Not only is it one of the very few Dump concerts ever to take place outside of New York City … it’s one of the very few Dump concerts ever, as in over 20 years of this project he’s apparently played fewer than 20 shows total. So, definitely a special thing, and one you don’t wanna miss. In comparison to McNew’s work with Yo La Tengo, Dump is definitely a more ramshackle / home-made affair, although plenty of the elements from YLT appear here as well; sweet & sincere vocals, a constant state of overwhelming pleasantness, a bunch of oddball covers, and best of all a willingness to follow an aesthetic path to its conclusion; the title track from 1994’s long-OOP 10″ EP “International Airport” is a case in point; 12+ minutes of near-perfect, slow-building organ drone and guitar heroics, which finally breaks the tension with some cathartically gentle crooning. Fellow former Cviller (and Rolling Stone critic, though we don’t hold that against him) Rob Sheffield claims this is the best song ever recorded. I wouldn’t go that far, but it’s the song I’ve been listening to the most for the past month, that’s for sure. … All of which goes to say: tonight’s show at the Tea Bazaar should be pretty great. 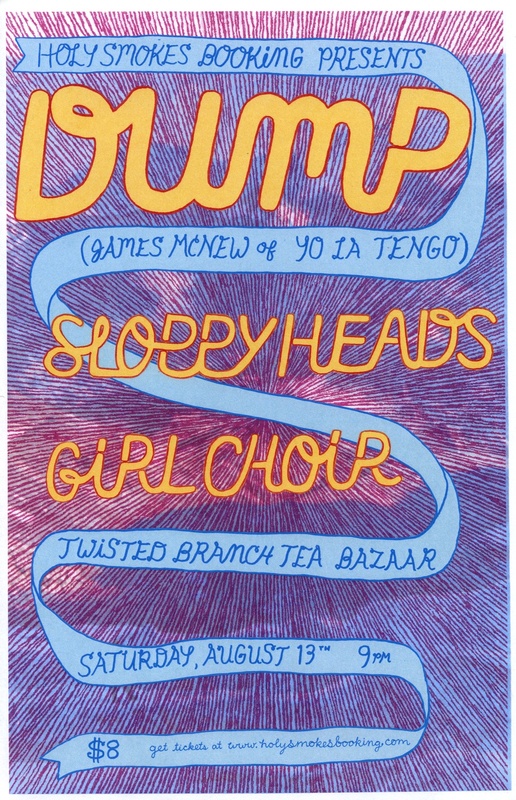 McNew is supported on the bill by a band of his fellow Brooklynites called the Sloppy Heads, and the local opening act is the debut performance of Girl Choir, a new band made up of old-school Cville dudes like Maynard Sipe and Matt Datesman! McNew has been quoted as saying “I’d drive down to Charlottesville to hear this show even if I weren’t playing in it.” Doors open (or rather, cover will begin being collected) at 9pm, the cover charge is $8, and it probably will sell out, so get there early if you wanna see it. If you’d like further convincing, you can read Andrew’s brief interview with James in this week’s C-Ville Weekly, or hear Dominic’s much more in-depth on-air interview with James on his WTJU show this past Wednesday (click on the Aug 10th edition of “Nowhere Near” — named after a YLT song! — to stream the show, the interview comprises the whole second hour of that 2-hour program). I forgot to put it on the poster, but I should also note that WTJU is of course presenting this show. If, for some crazy reason, you’d rather do something else tonight, you have plenty of options to choose from. CLAW, or the Charlottesville Lady Arm Wrestlers, are doing another one of their semi-annual events tonight. What was once a fun, funny spectacle in the back room of the Blue Moon Diner is now a nationwide movement, so it’s never too late to jump on the bandwagon and find out what you’ve been missing… especially since Invisible Hand are this evening’s house band at the event. I’m not sure what the cover is — that one might sell out, too! — but if you’re up for crazy costumes, wacky exploits, and celebratory displays of female strength, you should check it out. There’s also a concert of note at the Southern — former locals BirdLips are returning as part of their ongoing non-stop touring/recording thing, and this time they’re supported by locals ManorLady (who might be taking a small hiatus, or at least playing locally a lot less often, after this show since one of their band/family members is moving away). There’s a third band on the bill called Royal Forest, though I don’t know much about them. The doors open at 8pm and the cover charge is $8. Those are two fine events, and on any other night I’d totally be up for either of them. Tonight, however, I am going to hear Dump! Hey James, cover for CLAW is 5 bucks and gets you 5 CLAW bucks to start your betting/bribing with. Tonight the funds will go partly to our injured wrestler for medical costs and partly to a CLAW emergency fund, which we will set aside for urgent needs as they arise. Enjoy the Tea House and thanks for the shout out! Love that poster so much!